‘Project Nightmare’ is a movie that has haunted my sleep for years. Literally haunted my sleep in that the several times I tried to watch it, I ended up falling asleep. I chalked it up to this film being a bit of a rambling disjointed mess coupled with the fact I seem to inevitably end up trying to watch it at three in the morning. This time I made a concerted effort to watch the whole thing because it certainly seemed like a film I’d enjoy. Armed with an energy drink and a reasonable time of day, I sat down and watched it from beginning to end. I can’t say I’m any wiser as to what the hell it’s about. Two scientists, Gus (Charles Miller) and Jon (Seth Foster) are wandering through a desolate landscape on the run from something that destroyed their camp. There doesn’t seem to be much in the way of civilization around for miles, but they do find a cabin with a young woman inside named Marcie (Elly Koslo). Marcie, Gus, and Jon look for a nearby restaurant to use the phone. They come across a man (Harry Melching) in a car with a flat tire. He says he had to make an emergency landing in his plane, when he found this car and started driving for help. The man has a heart attack, the restaurant is closed and the payphone doesn’t work, and Gus steals the plane and ditches everyone. He lands near a compound with a pyramidal building and wanders some hallways. There’s some nonsense about Project Touchstone, and manifesting your fears and then a glowing computer face shows up. Now that I’ve written that out, it does feel a little bit like an excerpt from a dream diary, and if that was Donald M. Jones’ intent then ‘Project Nightmare’ is entirely successful. If it is to build any kind of narrative cohesion then it is an utter failure. David Lynch, another director who infused his stories with dream logic, gives us threads that we think we can follow only to see it descend into the murkiness of dreams. ‘Project Nightmare’ throws you into its surreal landscape and never really gives you anything to hold on to. It sounds interesting in theory, but it practice it’s a bit of a slog to get through. 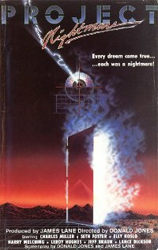 To the film’s credit there is a thick atmosphere of approaching doom, and the computer effects, although very primitive, give the various visions and threats a uniquely weird edge. The acting isn’t spectacular but it never gets bad enough to take you out of the story. The desert landscape is very foreboding, eerie, and easily the highlight of movie. It is by no means an easy film to endure, but its few moments of weird horror are compelling. I can see it being a film to re-watch over and over again to try and eke out a clue as to what’s really happening. If you’d like to experience a waking nightmare in all its VHS glory, give ‘Project Nightmare’ a try.